At Cryo Recovery, we are all about choosing the Health Optimization and Prevention Model over the current “Sick Care” model of our medical system. In health optimization and prevention, one’s inflammation bio-marker should be one of, if not the most tracked bio-marker. However, even with inflammation as a clear signal of deteriorating health, our medical “sick care” system is largely not setup to be preventative. In contrast, the goal of our "sick care" system is to simply monitor symptoms of illness, and to see a doctor once symptoms become worrisome. Oftentimes, we find ourselves completely reliant on the health practitioner, rather than being able to have a sense of agency over our health. In the Health Optimization and Prevention Model, we are able to detect and correct imbalances before they lead to much more serious health crises. From what we have observed, the health optimization and prevention model results in better health, and an increased ability to enjoy this one life that we are given. Just as the medical industry will diagnose an illness, the Health Optimization process detects inflammation. One of the key ways to check for inflammation is to have your High Sensitivity C-Reactive Protein (hsCRP) tested. (Learn more about hsCRP here). Having this inflammation marker tested can give you the feedback that you need in order to implement changes leading to the prevention of further illnesses. If you do not have the ability to test your HS-CRP, here are some critical inflammatory symptoms that you can monitor on your own. As you know, it is much easier to correct an imbalance vs. treating a disease. Systemic inflammation is the body's warning signal that something is wrong with our cell’s mitochondria. There are six major causes of inflammation that can be corrected in order to reduce inflammation in our body. 1. Environment: In this category, you will want to ensure that you are monitoring air quality, sleeping conditions, lighting, attention to aesthetics of the home, work environments, and our time in nature. 2. Diet: By now, it goes without saying that diet is a major contributor to inflammation. Monitoring and eliminating the amount of simple carbohydrates, sugars, and refined and processed foods from your diet will have a significant impact on your body's inflammation. 3. Relationships: Humans are social in nature. We not only need social interaction, but also, we must protect the quality of our social interactions. It is often said we are the sum of the five people that we spend our time with. If we are to have positive relationships, we must surround ourselves with the kind of people that believe the same. 4. Structural Problems: As creatures of movement, we are constantly using our bodies to achieve our goals and complete our daily tasks. 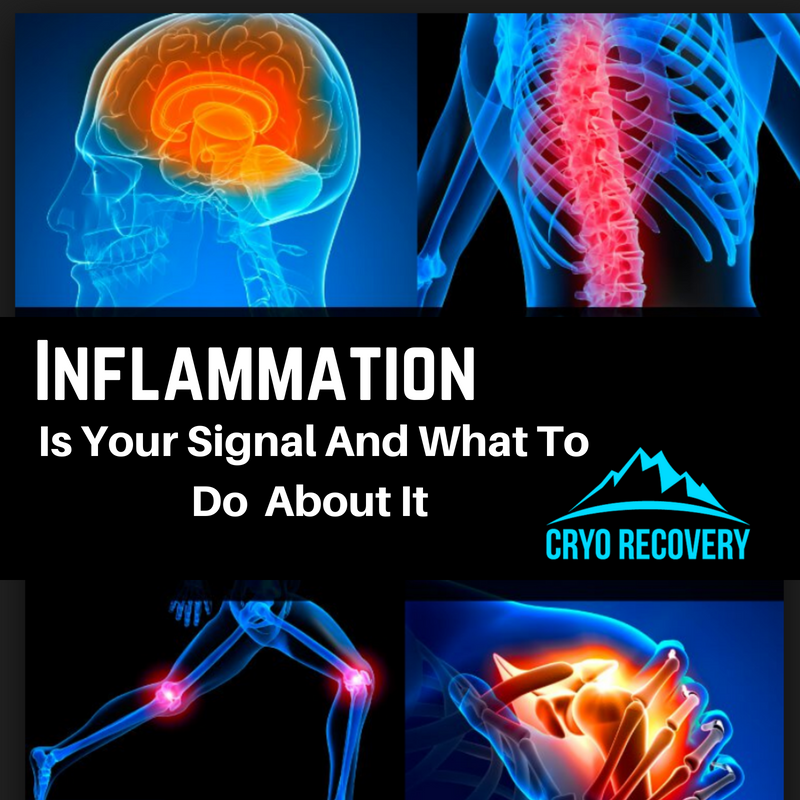 Unfortunately, due to past injuries, poor posture, and muscular imbalances, our bodies are constantly release inflammatory cytokines that increase our level of systemic inflammation. There is great importance to ensuring the balance and strength of our muscular systems, along with solving past injuries in order to maintain better control over our inflammation levels. 5. Stress: This category includes ways that you can increase stress resilience through hormesis stressors and meditation. Exercise, along with thermal stressors such as cryotherapy, are great ways to increase the amount of stress that you are able to withstand, resulting in a reduction in inflammation. In fact, many studies have shown how both cryotherapy and exercise increase norepinephrine, a hormone that blocks many of the inflammation precursors. 6. Detoxing: It is well known that toxins are contributors to inflammation, due to the body seeing them as foreign invaders that need to be attacked. However, constant immune system responses create long-term inflammation, and lead to the development of diseases. In terms of monitoring this category, it is critical to see how your cells may be methylating--or detoxing themselves from these toxins. Some major items to look at are what genes, deficiencies, and exposures may be causing the over and under methylation of your cells. At times, it can seem overwhelming to know what is best your health. We hear so many things from television, friends, family, and other sources. However, if there is one big item that should be on everyone’s list of health concerns, it should be controlling and managing inflammation. Take it from respected MD and functional medicine practitioner, Dr. Mark Hyman, when he says, "...nearly every modern disease, from autoimmune diseases, to allergic diseases, to digestive problems, to heart disease, cancer, diabetes, and dementia--is caused by inflammation". Association between chronic obstructive pulmonary disease and systemic inflammation: a systematic review and a meta-analysis. We believe that it is not in our nature to suffer, get sick, or wait until illness hits. We provide options for our customers to help heal, maximize and recover their bodies, all the way down to the mitochondrial level of the cell. This is simple...give people the chance to live life not dependent on anything other than what was given to us by our Creator. Much like you, we don’t want to be dependent upon chemicals, procedures, and other invasive methods that at times can cause more harm than good. We are the future of being healthy!